On March 1, 1868, blessed Papoulakis was resting on his hard mat at the home of a Christ-loving man named H. Paizi Lianou in Vathy. He peacefully and calmly foretold that he was preparing for his eternal journey. Lying on his scanty mat on the floor, and now completely exhausted, he refused all food. His friend Maratos the doctor visited him and asked if there was anything that he needed or that he could do for him. The Elder replied, “There is nothing that I need; I’m getting ready to depart.” He called for the devout and virtuous priest-monk Agapios to draw near him for the last time. Having confessed, he then became silent, waiting to give over his spirit to its Maker whom he so loved and to whom he had devoted his entire life. As Friday night progressed toward Saturday - March 12 - Papoulakis’ condition became quite serious; at five o’clock on Saturday morning, he slept the blessed sleep of the righteous, in whose ranks he had shown himself to be numbered since childhood through a life of fasting, vigils, and ardent struggles. At the instruction of the Metropolitan, the Abbot of the Monastery of the Katharon (the Pure) undertook the Saint’s burial. Going through his clothing, they found not even the smallest amount of money. With his material poverty he set his seal on the meaning of poverty in its fullest sense, something he had practiced throughout his entire ascetical life. They discovered that in his right hand, on a paper rolled up like a small cylinder, he was holding his final wish: to be buried outside behind the sanctuary of the church of Saint Barbara — for which he had toiled so much for its construction and completion — in the place where he had planted a myrtle tree with his own hands. The Elder’s desire, of course, was carried out, but only after much agonizing effort and struggle on the part of the church officials, because of the great numbers of people that were gathered there. As soon as it became known to the people that their beloved Papoulakis had reposed and was going to be buried, such a multitude of people flowed in from all over the island that it became impossible to make the preparations for the burial. They first took his holy remains to the church of Saint Nicholas of the Strangers (ton Xenon) in Vathy, where they chanted the service for the dead. His body remained there throughout the night, and the veneration of the holy relic continued without a pause. In the morning, the Chancellor (Protosynkelos) of the Metropolitan See extolled the Elder’s virtues and righteous life. Afterwards, he ordered his remains to be taken to Stavros, in order to be buried there at the church of Saint Barbara, according to the Saint’s wish. The entire crowd followed behind the body in a drenching rain. In spite of the downpour, his holy remains stayed dry, and this moved the crowd to compunction all the more. Arriving at the church of Saint Barbara, they placed the Saint’s casket in the middle of the church and, once again, the faithful began to draw near. With tears they expressed their unbearable grief; as they themselves said, they had lost their common father, benefactor, protector, and, in general, the one person who supported them. His remains were in danger of being cut up due to the devotion of the people, who had cut to pieces most of the shroud for holy keepsakes and for the blessing of water. When night was drawing near, the Abbot of the Katharon, being responsible for his burial and seeing that the congestion was great, announced to the people that the burial would supposedly take place the following day. The people believed the Abbot’s words and departed for the following day. 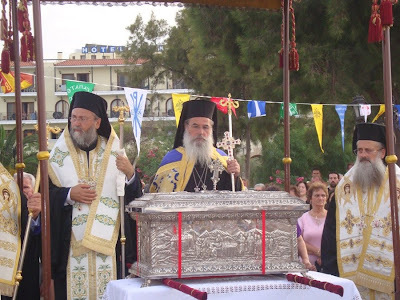 Thus they found the opportunity to do the burial that same day - the evening of March 3, the Sunday of the Veneration of the Holy Cross - outside, behind the Holy Sanctuary, in accordance with the desire of holy Papoulakis. One evening, the boy’s parents saw Papoulakis in their sleep telling them, “Don’t be afraid; I will make your child well.” The parents vowed to make a votive offering of a bell to the Church of Saint Barbara. The child became well, and they brought the bell, which still exists today. Because the bell was big, however, they did not install it at Saint Barbara’s; instead they exchanged it with the bell at the parish church in the community of Stavros. Olympia Megalogeni Lekatsa recounts that a relative of hers, Meropi Lekatsa, was a poverty-stricken orphan. One evening, she saw Saint Papoulakis in her sleep, and he told her, “Tomorrow, go out from the Panagia, where the rock is. Lift up a stone that is there; under it there are two pentares.” Meropi went to the place Papoulakis had indicated and indeed found the two pentares. Papoulakis spoke to her once again. “Every morning, go there and lift the stone, and you will find two pentares.” Thus the poor girl went every morning and received her “salary.” Out of her excessive joy she mentioned this to others, and from then on she no longer found anything there. From this we see that, even after death, the saints prefer to remain in obscurity and to do their almsgiving “in secret” (Matt. 6:4). Magdalini Floka-Sykioti from Stavros tells us that from childhood she had asthma and had been praying continually to blessed Papoulakis to make her well. In her sleep, she saw herself going to Saint Papoulakis’ grave and venerating it. A monk (it was Papoulakis) was following her and spoke to her. “Magdalini, I will always be with you.” From that moment her asthma ceased. Because of this, she made a votive promise to make the platter of kollyva, the sweetened boiled wheat, every year at the Saint’s memorial service, for the rest of her life. Where we should note that the inhabitants of Ithaki gather at Saint Barbara’s every year on the day of his repose and hold a memorial service for him at his grave, believing that this is the way to honor him as a Saint. Gerasimos Kouvaras relates that, during World War II, he was on the front line. One evening in his sleep, he saw himself behind the Holy Sanctuary of Saint Barbara’s, where Papoulakis’ grave is. When he awoke, he wondered what this meant and called upon Saint Papoulakis with faith. Shortly thereafter, he was overcome by a high fever and vomiting. They notified the sergeant, who ordered that they take him down to the doctor, two hours by foot from the front. The doctor could find nothing wrong with him. In the meantime, the Italians had launched a mortar attack and demolished the front line. Returning healthy to his place, Kouvaras realized that, if he had been there, he would have shared the fate of the others. Thus from what took place, he saw that Saint Papoulakis had indeed protected him. Ismini Kaladelphou from Stavros relates that when she was eleven years old, in 1936, her father was very ill. The girl had a great devotion to Saint Papoulakis and prayed ardently that he would make her father well, because he was in danger of dying. One morning, she was assisting at the archaeological excavations at the Pilikata site. While she was by herself and absorbed in her thoughts, she saw the Saint in a vision telling her, “Don’t cry, my daughter; your father will get well. But you must go and light the votive lamps before Saint Papoulakis and Saint George, because they have gone out; and don’t worry about your father.” The Saint then immediately vanished from before her. Her father miraculously became well, since she had gone on her knees to the Saint’s grave and lit the votive lamps. “Anastasia, I don’t like what you are doing, washing the children’s soiled clothing in my trough.” When the woman ceased using the Saint’s trough following his intervention, a large swarm of bees nested inside it that produced many kilos of honey. Anna Megalogeni states that when she was a child, her brother Vasilis developed a seizure disorder. Their mother, Akrivi, went to the trustee of Saint Barbara’s Church, who told her, “Don’t be afraid; we have the Saint. Make a votive offering to the Saint.” “What should I offer?” asked the forlorn mother. “Offer an ihrami,” she replied (that is, a heavy woolen bedcover). As soon as she promised the ihrami to the Saint, her son became well. She sewed into this bedcover a hair from the Saint’s belt, which she had wrapped around her sick child as a blessing. Anastasia Lekatsa from Kalyvia remembers that when she was fifteen years old, the shepherd S. Paizis would sleep on the mountain with his flock during the summer nights. The shepherd said with awe that one night he saw light ascending from the opposite mountain of Vigla. It went to the Church of Saint Barbara, and would drop from sight behind the church, where Saint Joachim’s grave is located.